It’s a general belief that the circuitry of young brains has robust flexibility but eventually gets "hard-wired" in adulthood. As Johns Hopkins researchers and their colleagues report in the Nov. 8 issue of Neuron, however, adult neurons aren’t quite as rigidly glued in place as we suspect. The investigators, led by David Linden, Ph.D., professor of neuroscience, took advantage of a new technique known as two-photon microscopy that let them literally see living neurons going about their business in the intact brain. The researchers injected fluorescent dye into the brains of mice to light up a subset of neurons and then viewed these neurons through a window constructed in the skull of living, anesthetized mice. Figure Caption:Left: An image of the cerebellum showing labeled main trunk axons (green) and their target neurons (red), with which they form synapses. This image was not made from a living animal, but rather from a thin slice of fixed brain tissue. 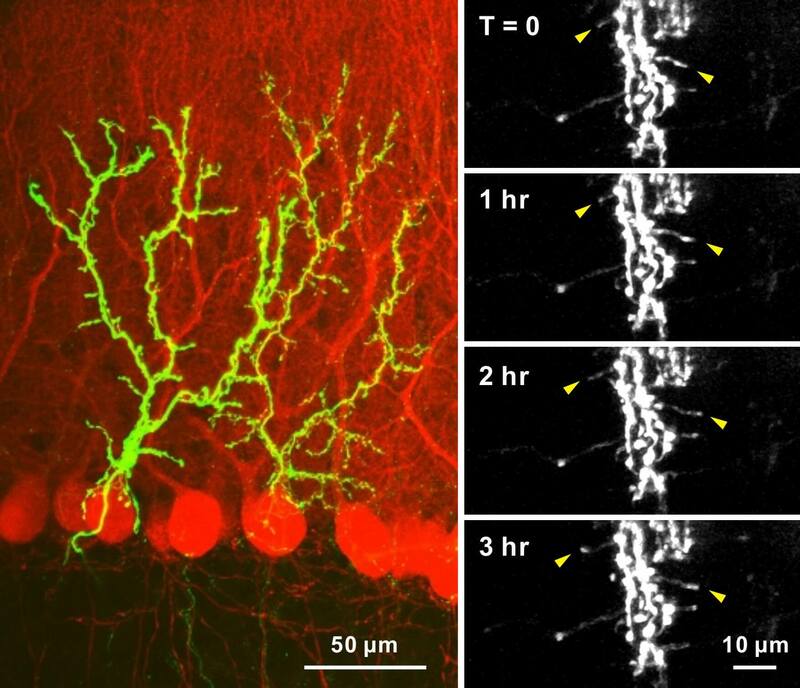 Right: Exemplar time-lapse images of axon in the intact brain of a living, anesthetized adult mouse. Both the degree of magnification and the orientation of the axon are different from the ones shown in the left picture. The main axon trunk was stable but a few side-branches showed elongation over a period of several hours (yellow arrowheads). They examined neurons that extend fibers (called axons) to send signals to a brain region called the cerebellum, which helps coordinate movements and sensory information. Like a growing tree, these axons have a primary trunk that runs upward and several smaller branches that sprout out to the sides. But while the main trunk was firmly connected to other target neurons in the cerebellum, stationary as adult axons are generally thought to be, "the side branches swayed like kite tails in the wind," says Linden. Over the course of a few hours, individual side branches would elongate, retract and morph in a highly dynamic fashion. These side branches also failed to make conventional connections, or synapses, with adjacent neurons. Furthermore, when a drug was given that produced strong electrical currents in the axons, the motion of the side branches stalled. Why the brain would want such motile, non-connected branches is the next mystery to tackle. Linden thinks they may present a second mechanism for conveying information beyond traditional synapses or assist in nerve regeneration, quickly forming synapses should nearby nerves get damaged. "The ability to make time-lapse movies of axons in the living brain gives us a powerful tool to explore axon regeneration that underlies neural recovery following stroke or other brain trauma," Linden says. The research was funded by the National Institute of Mental Health; the Ministry of Education, Culture, Sports, Science and Technology of Japan; and the Japan Society for the Promotion of Science. Authors on the paper are Masahiro Fukaya and Masahiko Watanabe from Hokkaido University School of Medicine and Hiroshi Nishiyama and Linden of Johns Hopkins.